Taste of the Wild Wetlands with Roasted Fowl Dog Food is a grain free formula with sweet potatoes and peas that provides highly digestible energy for your active dog. 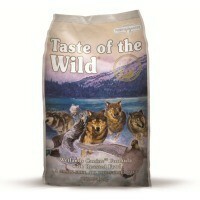 Made with real roasted and smoked fowl, Taste of the Wild food has been suplemented with fruits and vegetables to mimic the natural, balanced diet your dog would have 'in the wild'. The hearty formula delivers natural antioxidants to help give your dog a healthy lifestyle and is suitable for all life stages. Duck, duck meal, chicken meal, sweet potatoes, peas, potatoes, chicken fat (preserved with mixed tocopherols), egg product, potato protein, natural flavor, ocean fish meal, roasted quail, roasted duck, smoked turkey, tomato pomace, salt, choline chloride, dried chicory root, tomatoes, blueberries, raspberries, yucca schidigera extract.